Just a thought. But what about Howling Mine to keep cards in their hands ? Oppression Mindslicer Cunning Lethemancer and Sadistic Hypnotist Also I know he is not mono black but Nath of the Gilt-Leaf is a fun card to build around. XD I forgot to upvote! Did that, now I actually love this deck. After looking over your meta, only Teferi Chain Veil seems to be the unfavorable matchup, assuming it is the Highest tiered varient, and I still think you have good outs to that deck (Hex Parasite). 24 of your 27 matchups are favorable, 2 of them are balanced, and 1 is unfavorable. That is insane overall. If this deck doesn't force other players to make major changes to their decks, have them outright ban you and your shenanigans, I think you can expect a lot of wins handed to you, given this deck mulligans well. A couple suggestions, given you want to spend the money, I have found Liliana of the Veil to have good potential for discard as an engine, and can remove threatening creatures your hate cannot deal with. 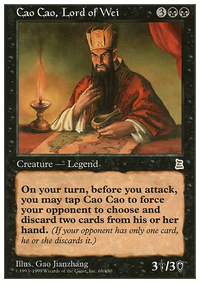 I still feel like other control/stax lists will fall to your ability to crush opposing players mana and hand apart. Painful Quandary is a very clunky card, so I wouldn't run it, but Cunning Lethemancer isn't much better, really hampered by the fact that you run cards like Humility, Necrogen Mists might be the best option for another discard enchantment, but I would prefer something better than that. I really think just a few cards like Smallpox or Pox could work, really making discard come from nowhere, I think Aminatou might have some good synergy with Words of Waste, but you still go back a card, because Aminatou forces you to put back a card, unless you are empty handed. Liliana Vess forces discard, but it targets the player, is clunky on mana, and is probably better as a tutor. What do you think. 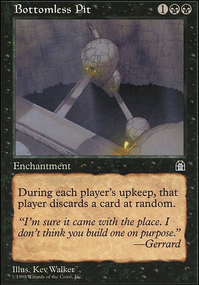 Any more cards like Oppression or Bottomless Pit you think we could run? magicaljellyfish on How many cards in hand? Pulled Cunning Lethemancer and just put Wrench Mind in its place for now. It was locking me out of cards too often for its effect to give me value. You discard when the creatures enter the battlefield. 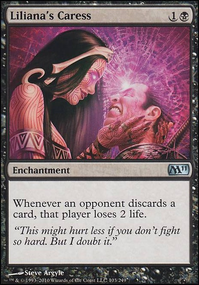 Other ways to discard: Liliana, Defiant Necromancer , Liliana Vess, Faithless Looting, Tormenting Voice, Cathartic Reunion, Daretti, Scrap Savant, Sarkhan, Fireblood, Jaya Ballard, Sire Of Insanity, Mindslicer, Cunning Lethemancer, Anvil of Bogardan, Necrogen Mists, and Liliana of the Veil to name a few. Just search discard on gatherer. I'd run Necrogen Mists, Bottomless Pit, and Cunning Lethemancer for sure. 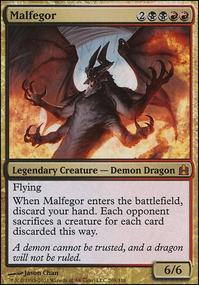 Consider a few other creatures who can make your opponent discard a card? 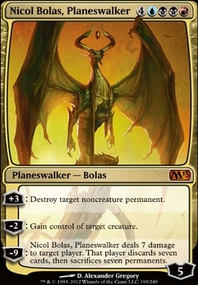 Using creatures who do this puts more pressure on your opponents. 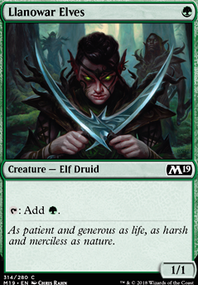 Elvish Archdruid and Reclamation Sage are staple budget Elves. 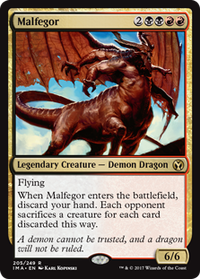 Commander's Sphere is an upgrade for Manalith. Check out Foreboding Ruins -- it gets you the T1 versatility of Blackcleave Cliffs with only a little less consistency. For Lili, you might also try Cunning Lethemancer. Best of luck, friend! Extirpate would be a good replacement in the sideboard over Cunning Lethemancer.